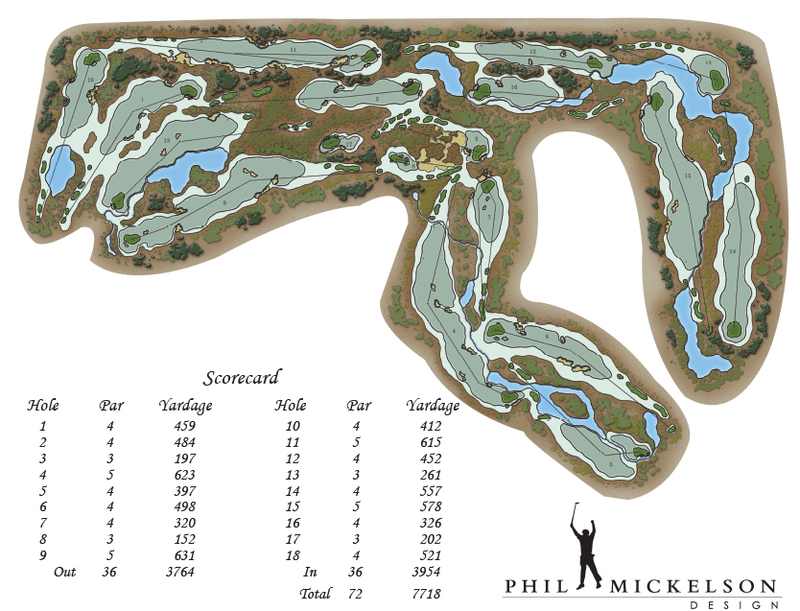 Phil Mickelson’s newest golf course design seems to be beckoning the PGA Tour with the layout able to be stretched to over 7,700 yards. The website for Mickelson National lists only yardages from the back tees. The site also has two course diagrams that give separate distances. One drawing lists the yardage at 7,621 yards including the 541-yard par-4 14th and the 579-yard par-5 15h. The other route plan has the course at 7,718 yards with a 557-yard 14th and a 578-yard 15th. Rick Smith, Mickelson’s former swing coach, is his architecture partner at Phil Mickelson Design. Mickelson National is scheduled to open in 2017. The project is part of the Windmill Golf Group. Other Windmill Golf Group facilities are Springbank Links, Silverwing Links, Boulder Creek, Harvest Hills, Northern Bear, Wilderness Club, Hamptons Golf Club and Wolf Creek Golf Resort. Wildness is located in Montana, the only Windmill property outside of Canada.